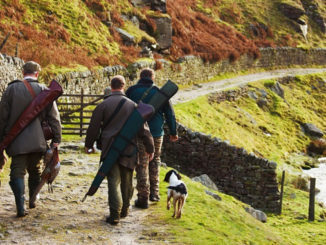 Increases in the number of trails appearing on the landscape are creating issues for hunters. Municipalities and Con-servation Authorities are quick to prohibit not just hunting along these public trails, but as in the case of the Grand River Conservation Authority, prohibiting possession of unloaded and encased firearms for hunters who want to carry their equipment to areas along the Grand River where they can legally hunt. This is not acceptable and we are engaging the Authority to reverse this decision. Ontario will see a dove season this year. The season will begin September 5th and end November 13th. Daily bag limit is set at 15 with a possession limit of 45. The Ministry of Natural Resources has also indicated that a new regulation to allow the use of a leashed dog to re-trieve lost harvested big game in areas where the use of dogs is presently prohibited during the hunt, will be insti-tuted this fall by way of a new license for the dog being used. Some other licenses and permits are being phased out. There will be no longer be a license to hunt raccoon at night. A small game license will be required and the conditions for hunting raccoon at night will still be in place. Permits for wild game dinners will also be eliminated, but again previous conditions will still apply. Please check with your local MNR office for details on these and other changes. Have an enjoyable fall. If you are hunting or fishing make sure you do so safely and in compliance with the regula-tions. Good luck! OFAH Zone J Past Chair Felix Barbetti volunteering with the Ministry of Natural Resources and local conservation Clubs at the Dunnville dam. Every April they diligently work with keep-ing the fish population in the Grand River and Lake Erie healthy, happy and thriving. Felix will be presenting more information on what they do at the OFAH Zone J September 15th membership meeting being held at the Dunnville Hunter and Angler Conservation Club. March 26, 2012 Comments Off on What’s Important To YOU?